Sat 6th Aug. & Mon 29th Aug. 10 - 4pm. NEW Dates : Wed 3rd Aug. & Wed 10th Aug. 10 - 4pm. Workshops for beginners. Simple felt making techniques will be explained, with everyone making one or more pieces of flat felt, experimenting with blending colours & textures as in the photos below. Plenty of ideas & examples of interesting projects will be on display. 'PAINTING with FIBRES' Fri 12th Aug. 10-4pm. 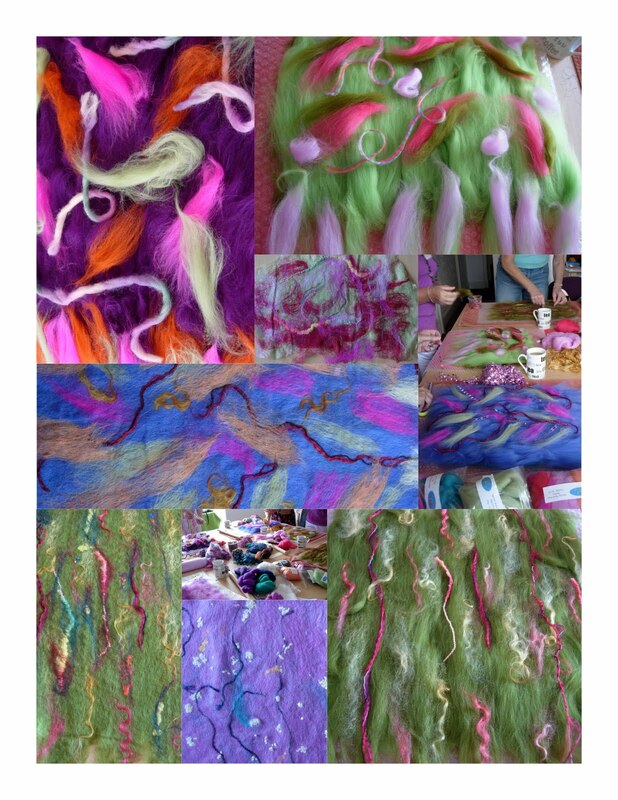 This workshop will show how to create a felt picture or landscape from wet-felted multi-coloured 'pre-felts'. The finished felt piece can be used as a wall hanging, cushion cover or a cover for a book. 'FELT JEWELLERY' Wednesday 17th August 10 - 4pm. 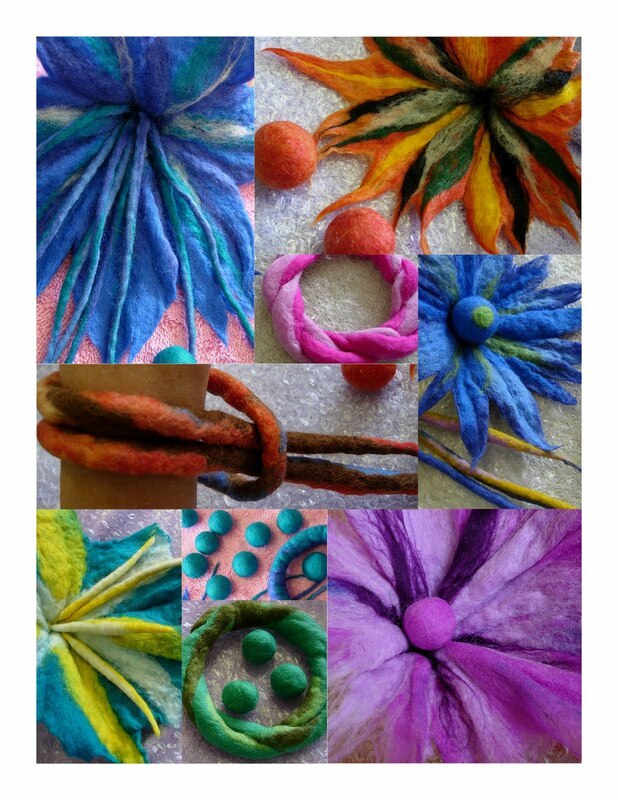 Creating felt flower brooches & corsages - perfect for those summer weddings! Making felt beads & bangles using a variety of simple felting techniques, with lots of ideas for decoration using needle felting, beads & embroidery. This workshop is also suitable for beginners. 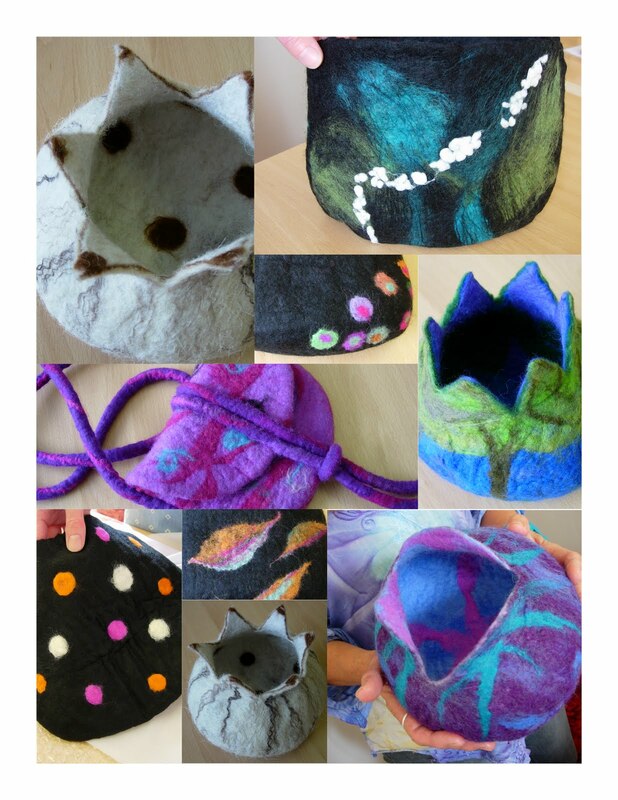 'FELT BAGS & BOWLS' Wednesday 24th August 10 - 4pm. NEW Date : Fri 19th Aug. 10 - 4pm. This workshop is for those that have some felt making experience and wish to complete a 3-D project. You can choose to make a seamless bag or bowl using a resist. There's ideas for incorporating handles and decorating with textures, threads & beads. Lots of bag and bowl designs will be on display for inspiration!